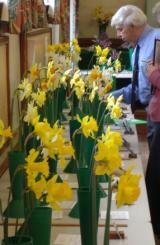 Each held in the Catisfield Memorial Hall, Catisfield Lane, Catisfield, Fareham. Many Different Classes. 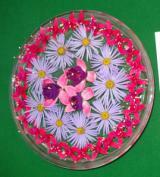 Up to 70, in sections such as: Flowers; Veg; Fruit; Floral Art; Children's; Craft & Home Produce; and The 'Top Tray' & 'Top Vase' classes. All Members receive a copy of the Show Schedule and are encouraged to enter. SPRING Sat 24th March 2012 viewing 1:30 - 4. 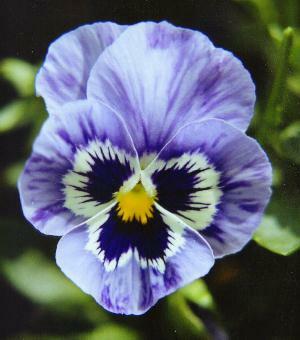 SUMMER Sat 30th June 2012 viewing 1:30 - 4. Visitors and new Members WELCOME. Just come along for a meeting. 12th January 2012 Jim Bettley - The Arctic Circle Expedition on 2 Wheels. 9th February 2012 Steve Harris - Hogs, Hops & Hangings. 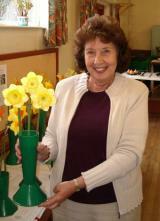 12th April 2012 Sally Burr - Make More of Your Plants (Propogation) Will bring plants to sell. 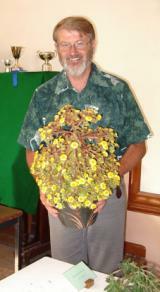 10th May 2012 Brian Madders - Chrysanthemums for all Seasons. May bring plants to sell. 14th June 2012 CHS Plant Swap Evening. 12th July 2012 Carol Watson - My Wild Alpine Collection. 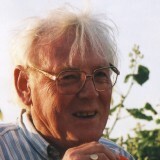 9th August 2012 Dr Alick Jones - How can we make our gardens more wildlife friendly. 13th September 2012 Alan Martin - A Borneo Experience. 11th October 2012 Jim Love - Nepal, A Plant Hunters Trek. 8th November 2012 AGM + Paul Bowers - The Inca Trail. Each year the member who has achieved the most points across the three Society shows is named as the "Catisfield Horticultural Society Gardener of the Year" and awarded the Bob Campbell Trophy. 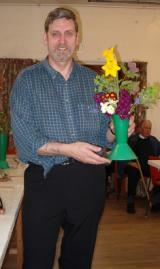 The 'Gardener of the Year' for 2011 was Doug Glading with 86 points, followed by Colin Parker with 76 points whilst third place was shared by Brian Mason and Ann Ryves with 46 points. 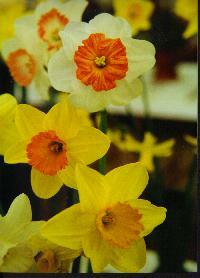 The RHS Banksian Medal for 2011 was also won by Doug Glading. 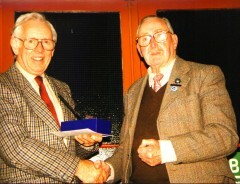 CHS President John Bridgland (right) congratulating Dr Hugh Carling - Hugh stood down as Chairman in 1999 after holding that position since the Society's formation. 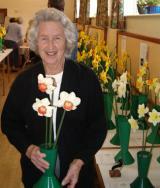 Some photographs of winners / winning entries in the Flowers, Vegetable, Craft, Floral Art and Children's classes. 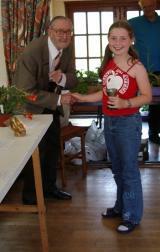 © 1996, 2011 Catisfield Horticultural Society. On the Web since January 1996. See also Catisfield - More Information about Catisfield. 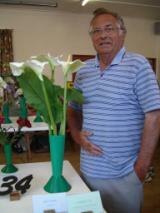 BOB CAMPBELL was Show Secretary from 1989 till his unfortunate death in September 2002. He helped this Society so much, in so many ways. He is sorely missed. John Bridgland at the 1972 CHS Spring Show The CHS President, John Bridgland reached the grand age of 100 in August 2007. Unfortunately we have to record that John died on August 15th. 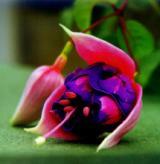 He will be remembered as a staunch supporter of the Society for tens and tens of years, as well as for the many fuchsia varieties he bred.